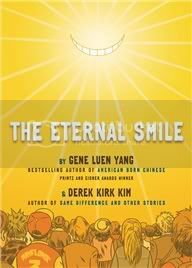 The Eternal Smile is a collection of three short stories by the authors of American Born Chinese and of Same Difference and Other Stories. 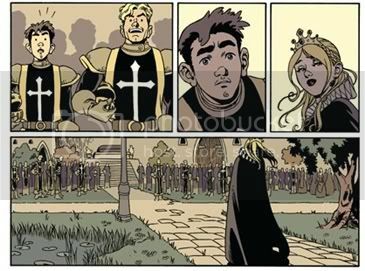 "Duncan's Kingdom" is, at first glance, a traditional high fantasy tale about a young man who has to kill the Frog King and bring back his head to win the princess' hand. But from the very beginning, when our hero awakes startled from a nightmare, we suspect that not everything is what it seems. "Granpa Greenbax and The Eternal Smile" is a story written in the tradition of older comics like Uncle Scrooge. Granpa Greenbax is a greedy frog always on the lookout for a new way to make money. When his assistant tells him about the Eternal Smile in the sky and the peace it brings him, Granpa Greenbax decides to start his very own cult. Finally, "Urgent Request" is the story of a lonely and underestimated young woman who decides to reply to an e-mail from a Nigerian Prince is urgent need of funds. As you can imagine, that e-mail is only the first of many with requests for just one extra loan. But I bet you can't imagine the turn things eventually take. If there's one thing these three stories have in common is that what I said about the first applies to all of them: things are not as they seem. These stories all seem to lead readers in one direction only to make them question their assumptions later on - assumptions about the story, the world it's set in, the characters and their motivations, and the beliefs that made us jump to certain conclusions. Maybe you're thinking that a book in which all stories use this kind of sleight of hand will be a little gimmicky, and if so I don't blame you. But somehow Gene Luen Yang and Derek Kirk Kim manage to avoid that completely. What I loved about these stories was not the fact that they all surprised me, but the fact that they were so human. The twists, if I may call them that, are not there to prove to readers how clever the writers are. They serve a purpose: they add depth to the stories, they make them more effective and more moving. Another thing these three tales have in common is that they explore the role of illusions, of the imagination and of fantasy in our lives. And I promise that by "explore" I don't mean "make some simplistic point about". There's no no one-size-fits-all conclusion, but rather an honest analysis of how the stories we are told and the stories we tell ourselves can deceive us, comfort us, or free us. Yep, kicking self for not buying this one of the many times I picked it up in the store. "Urgent Request" sounds really interesting. Great review! I love the "things are not as they seem" and "exploring our illusions" aspects. I haven't had that much experience with graphic novels but they definitely seem worth taking the leap. Another GN to add to my ever-growing list of ones to read for the next challenge! This is a must-read for me. Loved AMERICAN BORN CHINESE. Thanks for the great review! I really enjoyed American Born Chinese, so I think I would enjoy this one too. Great review. 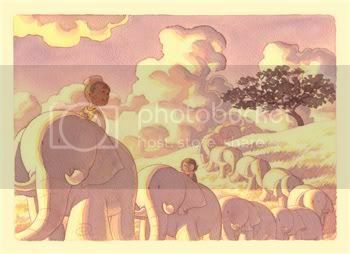 I am always amazed with the amount of amazing graphic books that you find. You must have a special radar system built in. This sounds like a great read, and I like the artwork. I've seen this one is some library journals and after reading your review I so want to read it!! Hazra: It was my favourite, but the others were good too. Jill: They ARE! Also, the medium is so varied that there's sure to be something for everyone's taste. Sandy: I hope Laza (this year's host) will host again! Marie: So did I! This one wasn't quite up there for me, but I still enjoyed it a whole lot. Vivienne: lol, a special comics radar - I like the sound of that :D I have Chris at Stuff as Dreams to thank for this one, though. Bart: I hope you enjoy it! ds: I'm a big fan of twists, but I hate the kind that feel show off-y or manipulative. Fortunately, these really didn't! You have a great way of expressing yourself in your reviews. Often after reading them I know exactly if a book will work for me, and why. I also get a real glimpse into the emotions that the book provoked in you. That being said, I think this book looks really unique. I don't often read many graphic novels, but this is one I feel like I should go out and grab. Thanks for an very insightful review on this! Very cool! 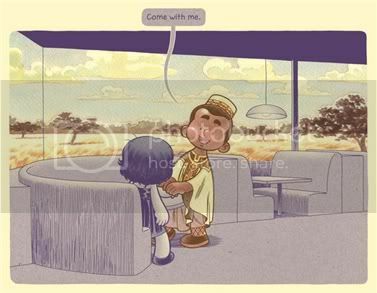 A short story graphic novel! Funny that we reviewed this so close to each other... We think alike, huh?